Despite the potential that Vdio may have had in the video streaming industry, Rdio has abandoned the project and is now issuing Amazon Credits to customers who purchased movies or TV shows from the service. Rdio had huge plans for Vdio when it was launched, as the music streaming service was trying to find a way to connect the two into a large media streaming company. Development of the service spanned nearly four years after it was founded in 2009, remaining in stealth mode until last year when technology publications caught wind of Vdio’s existence. Only a short time after the media found out about Vdio and what Rdio was planning on doing with it, the service’s launch date was pushed back as its founders decided to get rid of everything they had done in order to build up Vdio based upon Rdio pre-existing structure. 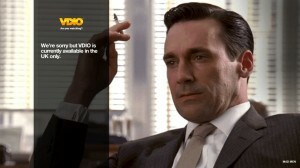 At the same time as a new direction was created for Vdio, it was revealed that the service would function on a subscription model, similar to Netflix. On top of the subscriptions, customers would be able to get VOD credits for media that was not normally available, such as new releases that had not yet made their way to the main Vdio service. Now that Vdio has shut down, it seems even less likely that any new company will be able to set up shop and build a reputable market share when competing against the likes of Netflix, Hulu, and Amazon.